One group that falsely lays claim to the heritage of Trotskyism, the Spartacist League (SL), recently published an article, “Why Marxists Support the EFCA” (Workers Vanguard, 30 January). Without saying so directly, this “corrects” the SL’s previous position against the “card check” bill (see WV, 8 December 2006). It also revisits an article in Workers Vanguard (8 October 1976), back when it stood on the program of revolutionary Marxism. That article noted that in 1935 when Congress passed the National Labor Relations Act (NLRA), “Trotskyists opposed the Wagner Act as a threat to labor’s ability to strike.” According to today’s “post-Trotskyist” WV, “In fact, as far as we know, the Trotskyists neither explicitly supported nor opposed the Wagner Act.” This is so much horse manure. “Under this bill a National Labor Relations Board [NLRB] is to be set up to ‘enforce’ collective bargaining, etc. Thus the way is paved for eventual greater control of government over the unions.... [T]he basic concern of these government agencies is never that of enforcing the rights of the workers, but that of maintaining ‘industrial peace,’ in other words, preventing strikes or if they break out somehow, ‘settling’ them, getting the workers back to work as quickly as possible. Trotskyists in the 1930s didn't oppose the Wagner Act? See for yourself. Article from the New Militant (4 May 1935). 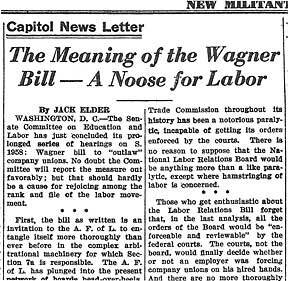 While opposing the Wagner bill, the Trotskyists did say that its passage could give the impression “that unionization will get government support and so to stimulate organizing campaigns and strikes.” In that case “militants will take advantage of the situation” so that workers can “learn the true nature and function of all capitalist governments.” Genuine Marxists (i.e., Trotskyists) oppose any mechanisms of government control of labor, whether by card check or NLRB-supervised “elections.” A real union organizing drive would rest on mobilizing the workers’ strength in action, including possible strike action. Given the balance of forces and the need for unions to function in the capitalist legal framework, it may be necessary to make use of or participate in such procedures. But the tactical issue of how to deal with mechanisms for government certification once they are law is very different from calling for passing a law that slightly modifies but maintains those mechanisms. The latter-day Spartacist League now says that while supporting the EFCA, it opposes the compulsory arbitration provisions, which provide for an initial two-year contract imposed by the government if the union and employer cannot agree. However, in order to pretend that this is not such a big deal, the SL claims that “there are no legal prohibitions in the EFCA to prevent strike action during this four-month period” of negotiations leading up to the binding arbitration. This ignores legal precedent that will surely be used against the workers. The Supreme Court has ruled (in Gateway Coal Co. v. UMW, 414 US 368 ) “that the arbitration clause created an implied no-strike clause,” and thus a strike was not legally protected and could be ruled an unfair labor practice. And even if the union could legally strike, under the EFCA the outcome would still be subject to arbitration! The SL’s argument is just eyewash to hide the fact that it is supporting a bill to modify, but still retain, a key element of state control of the unions under the NLRA. Since one can assume that in hard-fought cases the employers will not agree to a contract, in practice this means that, while pretending to oppose binding arbitration, these pseudo-Trotskyists favor a system that will result in two years of government-dictated contracts. It is telling that while the latest WV article quotes from Trotsky’s 1940 essay on “Trade Unions in the Epoch of Imperialist Decay,” it doesn’t mention the demand that he considered key, for “complete and unconditional independence of the trade unions in relation to the capitalist state.” This is no academic matter. The most militant major labor struggle under U.S. jurisdiction in recent years, the strike by the Puerto Rican Teachers Federation (FMPR) in February-March of last year, was precisely against the colonial government’s Law 45, which bans strikes by public employees. The SEIU then sought to oust the FMPR using the union certification procedures of that law similar to those of the NLRA (see “Puerto Rican Teachers: Unbought and Unbowed,” The Internationalist No. 27, May-June 2008). The militant teachers union was decertified, but the ranks were able defeat the government-back SEIU affiliate in the subsequent election because they were prepared to defy this anti-labor law.